Iksar on Naga Sea Witch: "We’ve Been Discussing a Variety of Changes"
This one, this one is a long one! It turns out when you think the developers are being too quiet on an issue, all it takes is to spend $21.17 of your hard-earned cash on reddit ads to get them to come out and talk about things, which is exactly what /u/JamieFTW did. Now, please don't take that too literally, we're mainly speaking here in jest, but there definitely is a lot of quiet-time from the Hearthstone developers and whether or not that's appropriate, we've got some news to share on Hearthstone game balance today. Nothing is concrete right now, but here's what Iksar has been talking about this Sunday. It takes time to evaluate problematic cards. If something is simply "flavor of the week", it probably doesn't need a change. The team is constantly evaluating cards and playtesting every day, not just the days they public talk about doing it. They don't make announcements about exact changes on their social accounts because they want to make sure the information gets out to all localizations of Hearthstone. There can be info lost in translation which would be bad. Naga Sea Witch (NSW) style decks are definitely not "flavor of the week". For NSW, they are currently looking at the cost of the card or the overall design of the card for potential change targets. Barnes was on the list of cards to look at but no longer is. Most Wild decks have a tool to deal with him. If they make a change to the Odd Paladin Hero Power granted by Baku the Mooneater, it'll probably also be made to Justicar Trueheart. The obvious change they could make to Odd Paladin Hero Power is to make the Silver Hand Recruit a 2/2. Less swarm. If Odd Paladin needed more of a nerf, they'd change the Silver Hand Recruit to be a different minion, either for the new 2/2 or for the 2 1/1s. Current Paladin decks are weak to Cubelock which warped the meta in such a way where it was still beneficial to play Cubelock even though there are counters out there. Hunter is in a good position right now, no changes being tested or planned. The following cards have been discussed as being "potentially un-fun". Dean notes that not all of them would be changed if changes are made. Or more long-term. At this point it feels like it's going to be a higher than we would like population unless a change happens, so we've been discussing how best to go forward with that if it becomes necessary. This was a tweet reply to someone asking, but I'll try to give more context here. When we say we’re evaluating and playtesting every day, it’s actually happening. Not every time we speak on reddit or twitter (almost never, actually) is going to be an announcement of some grand change we’ve made. What we can do is be open about what our current thoughts are and the kinds of things we’ve been thinking about changing. When a decision does get made, community and dev will work together on drafting an official message, localization will translate that message into many different languages, then we’ll simultaneously release that message to every region. So, what have we been thinking about? For NSW, I think the original tweet was taken out of context, but that’s probably my fault for splitting the message up. What I intended to say is that it takes time to understand whether a strategy is a flavor of the week, but in the case of NSW decks, that time has passed. We’ve been discussing a variety of changes for either just the cost or design. We haven’t 100% landed on one yet, but will continue this discussion when we do. Don't forget Barnes as well. Can compete with Naga for the most hated card of wild. My great frustration is that paladin and warlock (as the two greatest offenders) are largely the same decks they were before the rotation. How did these cards make it through the K&K nerf pass and Hall of Fame move? 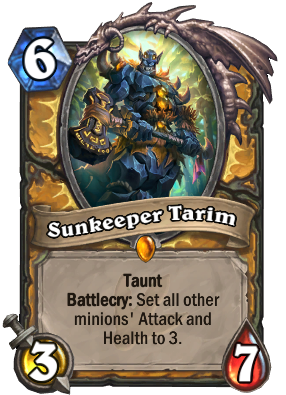 If you did end up changing baku paladin's hero power would said change also apply to justicar trueheart since they both use the same upgraded hero powers? 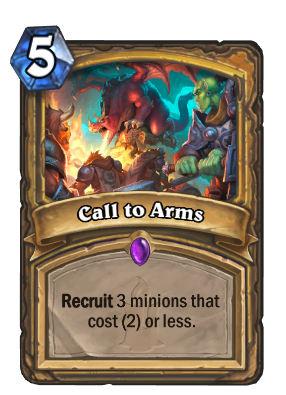 Obviously balance should be the major concern if the hero power is changed but please keep in mind that the upgraded Paladin hero power is one of the most flavourful around so if you do change it, try to find a way to preserve that unique class feel to it. When you say "Quest Rogue" you mean the Rogue quest card itself right? Just asking for clarity. 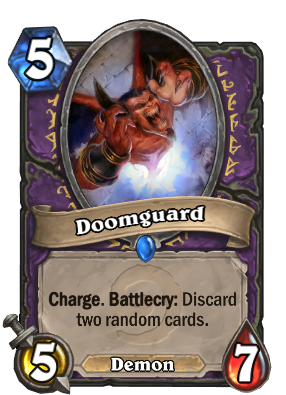 I know that sometimes "stuff happens" with these kinds of things, but perhaps I could just put forth this question: If you guys didn't really want to see a control-stomper in the meta, why did you print Sonya after gutting quest rogue the first time around? What changes should we expect for Hunter cards? I think we all remember undertaker and agree it's far past time Hunter gets nerfed into the ground. I think Deathstalker Rexxar should cost 9 Mana, for instance, and it's hero power should cost 4. They must have access to hundreds of thousands of match results. How can 5hey not have a precisely clear picture of the meta game breakdown? 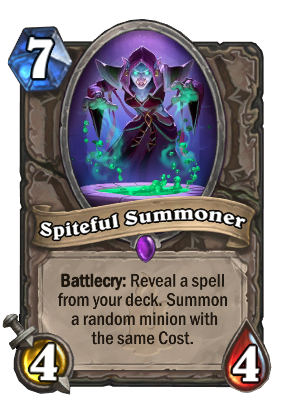 It is really interesting they aren't looking at Keleseth - shadowstepping him a few times is pretty nasty - and I didn't find it "fun" to play against a rogue who did that T2/T3. They need to really think about stuff that impacts the entire deck - those bonuses should only apply once - no matter what. Why remove Dark Pact from the game? None of those will happen - they ruin the cards totally. 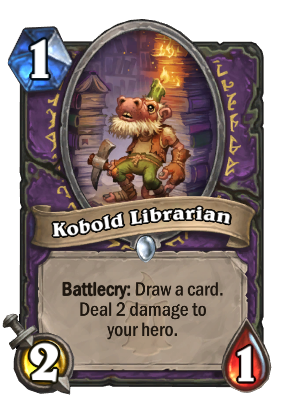 Like Kobold - it would never see play, ever. Given the power of other cards in this space, that card is not as out of whack as the others - I predict it won't be touched at all. 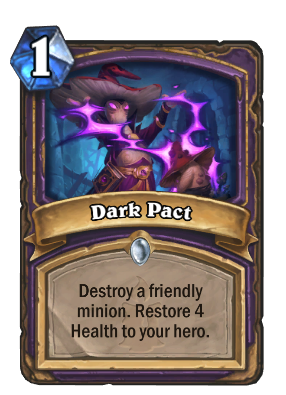 A different poster suggested Dark Pact only work on demons, and that's a fix the HS team should do - it is a big nerf to the cube and people will need to run rat catcher (at +2 more mana) to do the combo - which seems right. 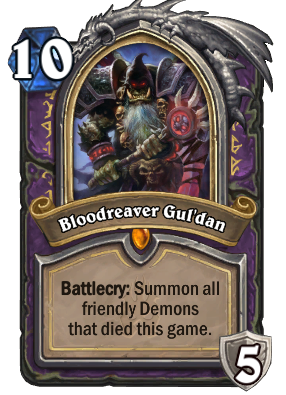 But I also think that the Voidlord himself is pretty over the top - I would expect his health dropping to 6 (vs 9) would be the fix. 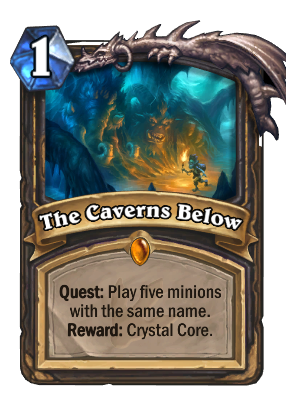 The Caverns Below can be tweaked a LOT and still have flavor. Like it's buff is dispellable/silencable; that it only applies to minions in the deck (not the board or hand). Easy stuff to adjust. 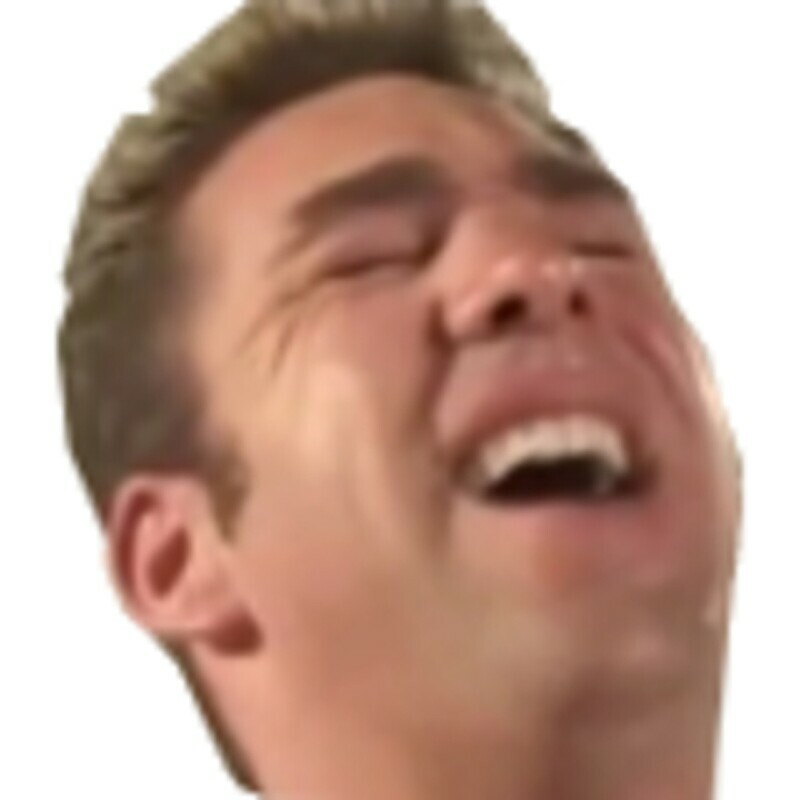 How about on top of any changes that get made Sonya Shadowdancer gets fixed so that cost reducing minions reduce the 1 mana Sonya copies again like it did before the worgen hotfix broke her interaction? I see no reason why Mechwarper should no longer reduce 1 mana mech minions in hand that were created by Sonya. That moment you realize the person asking the questions is a noob. "It's far past time Hunter gets nerfed into the ground. " I guess at like level 20 or something hunter could be problematic. Seems Like warsong nerfs are needed!!! Rin is incredibly slow and only allows the lock to play Azari if and only if they aren't being pressured too much on board. It is very possible to fight against Rin, you just have to actually try to kill your opponent as a control player instead of sitting back til the game goes to fatigue. Well the first time I put Rin in my cube lock build, the priest I was playing against used Chameleos to get the 4th seal - and then my Mana'ri pulled my 10/10 so no battlecry. After trying her once, she is not a card I am looking to try out again. 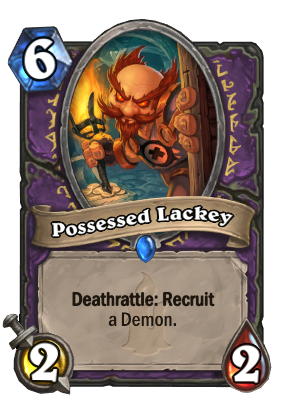 Doomguard, isen't he there because of lackey and weapon? Do they like the weapon design that much? "Hunter is in a good position right now"
Why on earth does Sea Witch need a discussion over "a variety of changes". Just revert it to how it was before you broke it. The card isn't being used for anything other than giants so clearly whatever they were actually trying to achieve isn't something the community's interested in. Even if they did desperately want a different fix why didn't they temporarily revert it months ago along with any of the other patch's/ updates? How did they change her exactly? they made it so that the set the cost to 5 applies before other cost reductions. so previously giants would have a flat cost of 5 rather than 5- whatever extra cost reduction it gets from its own effect. Spiteful Summoner. "Reveal a spell from your opponents deck. Summon a random minion with the same Cost". Gives you insight into the opponents deck with a touch of classic Hearthstone rng. Could pay off or it could summon a Snowflipper Penguin. Everyone plays the same 3-4 decks, so the only value in this is knowing if your opponent has a certain spell in their hand or not. This is not even complete info as they usually run spells as 2-ofs in most cases.